Thank you for your review on tripadvisor.com. 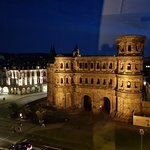 We very much appreciate your comments regarding your stay at the Mercure Hotel Trier Porta Nigra. It is nice to read that you had a pleasant stay. We will share your comments regarding the breakfast and the rooms. Thank you again for sharing your experience, and we hope to see you again soon.